High carbon steel, unsharpened handmade Iaito designed for heavy training use. This sword has the same weight and balance of your "battle ready" wakisashi without the sharp edge. The hardwood handle is using real ray skin and features a tight cord wrapping. All traditional parts have been used, including high quality copper tsuba and fittings, and brass collar and seppa. I have had this sword for a few months now and it continues to perform well. The tsuka-ito is still wrapped tight, and the saya still secures the blade snugly. 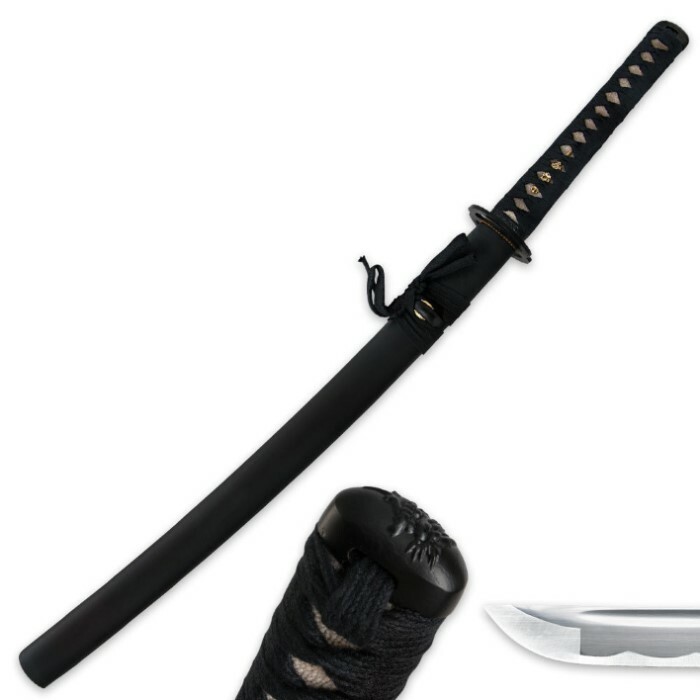 It is, however, not a true wakizashi, but more of a ko-katana, as the handle is about 3 inches too long. I personally like that though, so it worked out great for me. Something to consider before purchasing however. 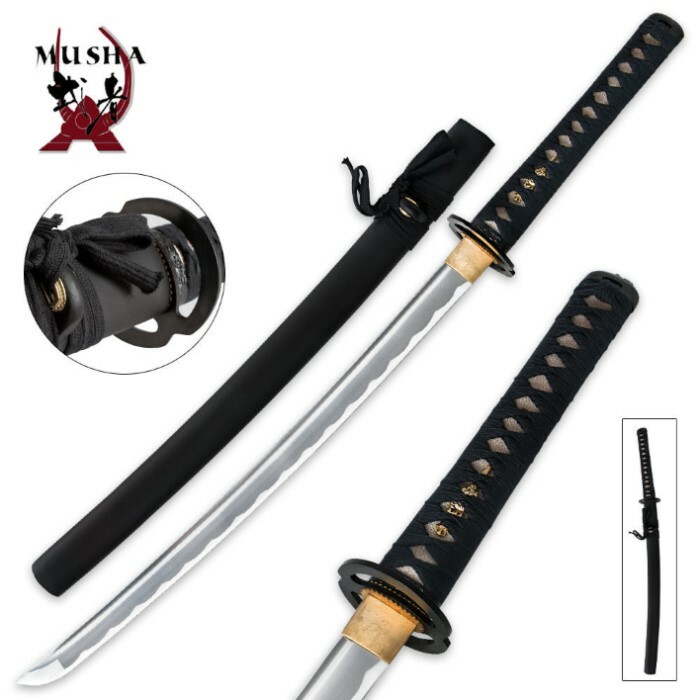 Anyway, I highly recommend this product for anyone looking for a quality sword for iai at an affordable price. I just received this blade and it is as advertised. With the matching katana, it makes an attractive display set. I could have purchased the 3 blade set, but after seeing how those are made, I knew these were much better. A great value for what I paid and for how I will be using them. I may make later purchases. Thank you True Sword for processing my order in a very timely manner. Just got the sword today and I have to say I'm AMAZED! Sturdy, feels like its sharpened counterpart, and looks good as well. The sheath is black matte finished, but I like it. The only problems I have with it is that at the top of the handle you can just barely see some wood behind the rayskin, and also "China" is stamped on the top seppa (spacer). Must have for anyone looking for a "beater" sword. You really can't ask for much more for less than $50.00. I got this to go with the katana iaito as a display and practice pair, needed something to work indoors with. I've had a few iaito in the past couple of years and by far Musashi is the best value. The blade rattles in the saya a little, but there are ways to remedy that if you really want to, and for the price that's a small matter (plus it's just a practice sword, perfection isn't exactly required). The only other thing is that I may end up retying the tsuka sageo as it's a little loose in some places and may become even more so after use (actually had this problem on my last musashi iaito, but was a quick fix). And as usual I tip my hat to the folks at trueswords for the remarkable customer service, quick shipping, and fantastic packaging. I swear by them and nearly all of my knives, swords, and what have you have been purchased through them. Absolutely fantastic. Beautiful blade. Just what I been looking for: a "cheap"but very well crafted blade unsharpen but really sturdy. It arrive very fast too. I have to say that I am a VERY happy camper. When I received the wakizashi, it was good as new. For the price it is, I am extremely surprised to get something of such quality. If you want a good unsharpened wakizashi, I highly recommend this one. I honestly almost feel like getting another to have dual set. Very well made. I wanted a Wakisashi and the price was right. Didn't need a training sword, so I sharpened it. Not a real easy project. As it had no edge, no way anyone could ever get cut with this sword, stabbed yes. As always ultra fast service from True Swords. First off, let me clarify one thing. This is not a miniature and "safe" sword for children; it is not a toy. This is a weapon, designed to inflict pain and to learn techniques that are used later to kill with a sharpened sword. 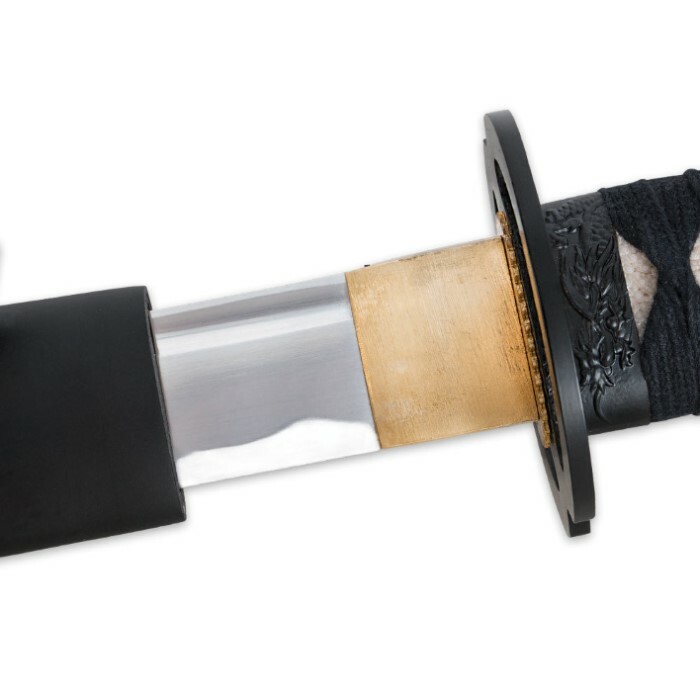 I'm not here to tell anybody how to raise their kids, but if you don't want your kids playing with a "real" sharpened sword, then you shouldn't buy this for them either. At any rate, onward with the review. In this day and age, the need to kill is highly over rated; all that matters is that you defeat you opponent, whether they are a sparring partner, some stranger who wants to pick a fight, or a burglar. This wakizashi is perfectly suited for just such a task! The sword is well constructed and feels very tight. The entire weapon is shorter than a traditional sword but longer than a knife; it has the length to deliver powerful blows, but is also compact enough to use indoors if need be. The blade edge is rounded as opposed to sharp (as advertised) and makes for a much safer alternative to a sharpened blade. Cutting is still possible if you can pack in the shear brute force, but this weapon isn't meant for that. However, if you must kill your opponent, the tip of the blade is extremely pointy, and would go straight through a target with ease. I specifically ordered an unbent blade (I own too many crooked blades) and True Swords made sure to clarify that the blade I was sent was indeed straight. And it is very straight, well within my satisfaction! Everything seems to be in proper working order on the sword I ordered, but there is one minor flaw: when moving the sword, I can hear something rattling within the handle, like grains of sand (I plan to disassemble the sword soon to figure out why). Whatever it is, I'm sure it has nothing to do with the construction of the blade. And True Swords has such great costumer service, that I know I would be given a replacement ASAP if it turns out to indeed be faulty. Never in my life have I ever been treated to customer service as great as that which True Swords provides. You better believe I'll be spending more money with them! Outstanding. Everything was properly tight and fixed and the sword was as described. Completely safe, the tip is only a little sharp. You can run your finger along the whole blade and be fine. Thank you trueswords / Musashi, very great buy.